The water is clear and colorless and will not irritate your skin. Beneficial effects: Provides relief for muscle soreness, neuralgic pain, illnesses and injuries. 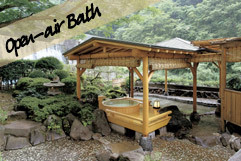 There are separate common baths and open-air baths for men and women. They are available 24-hours a day, so you can use them whenever you like. 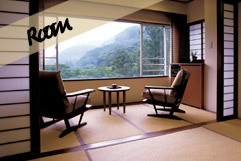 The open-air baths are beside a mountain stream that flows to the Sukumo River, and the sound is very relaxing. There are a stone bath and a cypress bath situated by a stone dam. The baths are surrounded by beautiful nature creating a pleasant rustic atmosphere. The ladies' open-air bath also has both a stone bath and a cypress bath. Enjoy the pleasant sound of the mountain stream until your heart's content. There are separate common baths for men and women. Please try the sauna as well.